Location: Virtual (our offices are in NYC). Most work will be done remotely with a flexible work schedule – at your own location. Initial training via Web. Time Requirements: This position will require approximately 10 hours a week and would begin ASAP. The timing of the work is flexible and can be done remotely for a majority of the time required. 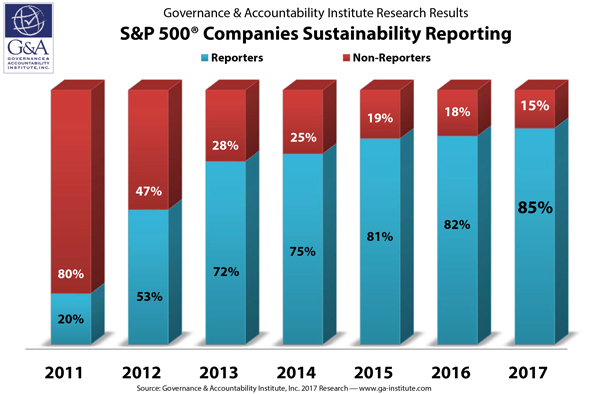 The Governance & Accountability Institute is a New York City-based company that specializes in research, communication, strategies and other services focused on corporate sustainability and corporate ESG performance (“Environmental, Social, Governance”) issues. GAI is offering the opportunity for an internship for a qualified student interested in learning more about these topics. This is a very fast growing area of interest to corporations, and Wall Street interests. The GRI reporting framework is the most widely used in the world for these types of reports. G&A is the exclusive data partner for the United States, United Kingdom and Republic of Ireland for the Global Reporting Initiative (GRI). The Global Reporting Initiative is a non-profit organization that promotes the use of sustainability reporting as a way for organizations to become more sustainable and contribute to sustainable development. GRI provides all companies and organizations with a comprehensive sustainability reporting framework that is the most widely used and respected around the world. Currently thousands of global organizations use the GRI to report on their Environmental, Social, and Corporate Governance strategies, impacts, opportunities and engagements. (www.globalreporting.org). The G&A Institute interns learn important elements about GRI reporting that can be used in their future work situations. As the exclusive US, UK and Ireland data partner of the GRI, The Governance & Accountability Institute’s role is to collect, organize, and analyze sustainability reports that are issued by corporations, public entities, not-for-profits and other entities in The United States, United Kingdom and Republic of Ireland for the benefit of all stakeholders. In this role the analyst will work as part of a team to analyze these reports for inclusion in the largest global database of Sustainability reports, the GRI’s Sustainability Disclosure Database (database.globalreporting.org). Learning to read, analyze, use, and structure data from reports using the GRI G3, GRI G3.1, GRI G4, GRI-Reference as well as NON-GRI corporate and institutional reports will comprise the majority of this assignment. The research will also contribute to several published research reports on various trends in sustainability reporting which are widely referenced by media, academics, business, capital markets players and other important sustainability stakeholders. The student(s) selected will have the opportunity to experience a fast-paced, highly-adaptive (and nurturing) culture in a small but growing company with a unique niche. This is a hands-on position with considerable learning opportunity for those headed for a career in corporate responsibility. Applicants should demonstrate a strong background and keen interest in ESG and Sustainability issues and topics. A plus: strong technical, communication, and organizational skills. Basic skills in Excel and researching on Google are required. Applicants with writing and editing abilities will have preference. Interested students should send a resume outlining education and skill sets. As an option, a one to two page introduction essay on what you would like to learn more about (in terms of your career goals), what your interests are, and anything else you feel may be relevant to the job/our organization will also be welcomed. Samples of writing or research on sustainability or other topics are also a plus. GRI has just released the latest of its “linkage documents”. This one is the first to link the CDP Water questions to the GRI G4 indicators. The goal of these linkage documents is to reduce “survey fatigue” and to allow companies to translate their disclosures between multiple important third party disclosure standards and data requests. Linking these disclosures through a comprehensive reporting index can also add value for the readers of reports which can look at data through the lens of their choice and quickly identify the most important and relevant information. Both organizations continue to cooperate on aligning best practice, thus avoiding duplication of disclosure efforts, and easing the reporting burden for the thousands of companies that use CDP’s water program and GRI’s Sustainability Reporting Guidelines. This alignment allows organizations to use the same data points in both reporting channels. The information provided through either channel can form part of a sustainability report using the GRI Guidelines and/or to answer parts of CDP’s questionnaires. Linking GRI and CDP: Climate Change (2015) can also be downloaded for free here. Sustainability – What Matters in the Aviation Sector? Recent research conducted by the Governance & Accountability Institute attempts to answer important questions for company managements in the Aviation Sector, by examining the disclosure practices of 18 global peer organizations publishing GRI reports in the sector. I recently returned from The Netherlands where the next iteration of the Global Reporting Initiatives’ Guidelines was released at the annual global GRI conference (which took place in GRI’s home city, Amsterdam).